Gary Rome Hyundai is pleased to announce its support once again for the annual Boston Marathon Jimmy Fund Walk. Last year, Gary Rome Hyundai donated $10,000 to pediatric cancer research at the Dana-Farber Cancer Institute. Through the support of New England-area Hyundai dealers, other Hyundai dealers across the country, and Hyundai Motor America, nearly $7 million total has been donated to the Jimmy Fund since 1998. Although donations, are mainly generated through vehicle sales, dealers like Gary Rome come up with innovative ways to further their support. Through Gary Rome Hyundai, contributors to the Jimmy Fund can now be a Buddy to help research pediatric cancer. In return, they’ll receive their own cuddly “Buddy” in return. “Buddy” has been a popular character in TV commercials and at Gary Rome Hyundai for years. 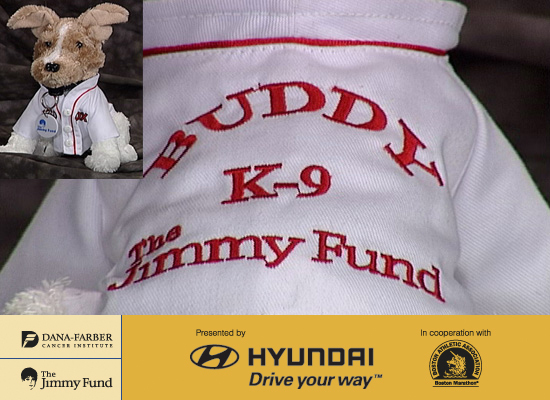 Now you can have your very own Red Sox jersey Buddy and help fund pediatric cancer research at the Jimmy Fund. 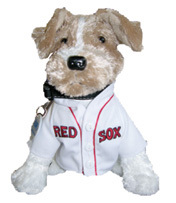 A $20 donation gets you the cuddly Buddy and proceeds will go to The Jimmy Fund at the Dana-Farber Cancer Institute. Last year, Gary Rome Hyundai donated $10,000 to the Jimmy Fund. To get your own Red Sox jersey Buddy and help strike out cancer, visit our store at 1000 Main St. in Holyoke Massachusetts or order online at http://www.hyundaiaccessorystore.com/Jimmy_Fund_Buddy.html today. Supplies are limited. For more information about Gary Rome Hyundai’s support of pediatric cancer research, and Hyundai products, please visit our website at http://www.garyromehyundai.com. This entry was posted in Uncategorized on August 24, 2006 by hasblog. It may not feel like it outside, but the dog days of summer are here. As we start to wind down yet another summer, it’s time to ramp up our new accessories for the Hyundai 2007 models. The 2007 Entourage, Santa Fe & Accents are already in the showrooms, and the 2007 Elantra is on the way soon! Labor Day & Back To School times means a lot of driving as the busy fall months start up. So make sure you keep your Hyundai vehicle in top shape by using only Genuine Hyundai maintenance parts. See our new tune-up parts page for more ordering information. Remember, we’re a genuine Hyundai Dealer so if you do not see what you are looking for contact us and we will do what we can to get it for you. As always we appreciate your business and thanks for helping to make us #1 in customer satisfaction. Accent Center Fascia Metal Grain – Silver $81.60 $77.52On Sale! Accent B-Pillar Applique – Black 3dr $69.00 $65.55 On Sale! This entry was posted in Uncategorized on August 17, 2006 by hasblog.